While hardwood flooring and solid wood flooring have won the favor of Chinese consumers, another type of wood floor has quietly entered people's sights. It is known as "the most environmentally friendly flooring material" and "the quietest floor" of cork flooring. "Like a wine bottle stopper!" This is the first impression that people have of cork flooring. Since it can be used as a bottle stopper, it should be a very healthy material. Therefore, cork flooring has won a favor of some consumers. The elastic foot feeling, super quietness, and environmental protection naturally become the first choice for a healthy floor. However, because of the above characteristics, people have always had considerable doubts about the use of cork as a flooring material. Is there sufficient abrasion resistance? Will it be pressed out of the pit by heavy furniture? Is it easily deformed by moisture? Will there be insects? Can it be cleaned and handled more easily? Question one: Can cork flooring withstand the various frictions of home life? When purchasing ground materials, people habitually use sandpaper and some sharp things to rub the surface of the floor material to judge its wear resistance. At the Portuguese cork-Switzerland flooring factory, the reporter also conducted experiments according to this method. As a result, it was found that the surface of cork flooring covered with wear-resistant materials such as ceramic paints did not leave any traces of friction. In this regard, floor experts explained that after covering different grades of wear-resistant layers, the cork flooring surface has sufficient abrasion resistance to withstand the normal friction in modern home life or public places. When people hear â€œcorkâ€, people are naturally misled by their names. 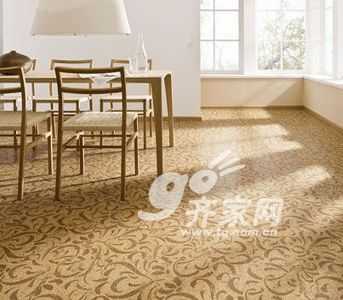 According to Professor Gao Zhihua, a wood floor expert, â€œsoftnessâ€ of cork is not to say that it is not strong. On the contrary, due to advances in modern processing technology, cork flooring is not only strong in appearance but also strong in appearance. , And to maintain a soft and elastic foot, the old children will not fall hurt the characteristics of this is the biggest advantage of cork flooring. In addition, in the book â€œA Practical Guide to Chinese Wood Flooringâ€ edited by Prof. Gao, it was recorded that as early as 1932, cork flooring was placed in the original ancient book library in Beijing, and it was still intact after more than 70 years. It can be said that the cork floor The wear resistance and durability are time-tested. In addition, many consumers also asked: â€œWill the heavy furniture put the cork flooring out of the pit?â€ In response, the cork expert explained that if the furniture legs are small on the ground, the furniture is heavy. It is true that there is a possibility of local depressions in cork flooring, but due to the special cellular structure of cork itself, it has the ability to restore the original shape after compression, so that when the furniture is removed for a period of time, the depression will gradually return to leveling. In addition, padding can be added to the legs of the furniture to reduce the pressure to avoid the above situation. Specialist doubts: Qualified cork flooring has high-strength wear resistance, very good resistance to wheelchair and wheeled furniture friction performance, but also has a good resistance to oppression and recovery performance. Question two: Cork has a small airbag, so it is easily deformed by moisture? Because cork flooring does not look so dense, people are still skeptical about this natural "soft" material. Will it be easily deformed by moisture, or will it be filthy? The production process of cork flooring is very rigorous. The cork bark undergoes a series of â€œexperienceâ€ processes before being processed into flooring: breaking, screening, filtering, stirring, hot pressing, curing, facing, etc., among which the hot-pressed molding The process makes the pelletized cork material a stable and balanced whole. Although the cork is born with tiny airbags, the treated cork has become pure cork particles, which are then rearranged together in an artificial hot press to form a new one. The structure system, for the outside, is completely dense and closed, and will not seep through the oil. The cork flooring that achieves a certain moisture content will not be easily deformed by moisture and will not hide dirt. In addition, cork flooring that has undergone special surface treatment can also be used in wet spaces such as kitchens and bathrooms. Experts' doubts: Cork is naturally impervious to liquids. Cork flooring is a product that has undergone heat-pressing and other processes. The surface is complete and closed. It is not susceptible to moisture deformation and does not contain filth. The presence of approximately 40 million tiny airbags per cubic centimeter makes cork a natural insulator, 50% of which has good thermal insulation. Question 3: Although the cork floor is close to nature, the foot feels warm, but is it easy to breed bacteria? The worms are completely misunderstood by people for cork flooring. When asked about the problem of not giving birth to insects to the technicians of the cork factory, they said that it was â€œabsolutely impossibleâ€. This confusion arises because the visual effects of cork flooring or cork wallboard achieve a particularly natural texture. Therefore, consumers who do not understand the production process are worried that it will be worms. Due to specific processing procedures, the cork material enters the factory from the forest and undergoes a series of cleaning and heat-pressing treatments. Finally, the high-density fiberboard is affixed together, and the cork skin and the insulating cork layer are attached to form a finished cork floor. Therefore, a piece of cork flooring, although it still looks natural and natural, it already possesses the industrious personality given to it by technology and technology to meet the needs of use. Specialist doubts: The texture and texture of the cork floor surface is determined by the processing of cork bark. It is close to nature and has stable performance. It has been verified that cork flooring will not breed molds, and will not cause insects, and will not cause human body damage. Any allergic reaction.